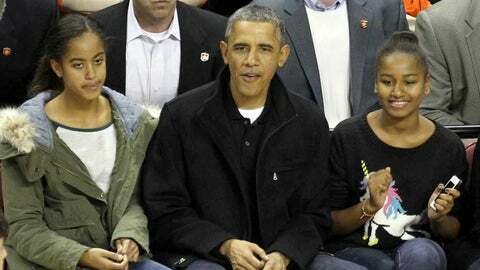 United States President Barack Obama with daughters Malia (left) and Sasha (right) prior to the Maryland Terrapins against Oregon State Beavers at Comcast Center. The President can’t wait to watch the Akron Zips. Akron opens play in the Diamond Head Classic in Honolulu Sunday night against Oregon State. The Beavers are coached by Craig Robinson, the brother-in-law of President Barack Obama. 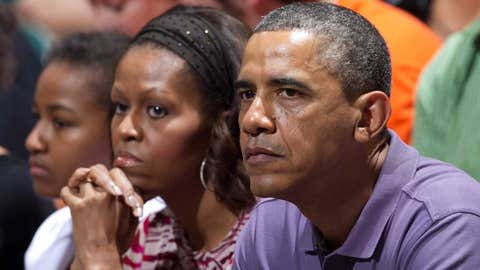 The Obamas are in Hawaii for the holidays, and there have been indications that Obama plans to attend the game. Asked this week if his team had ever played in front of the president, Akron coach Keith Dambrot said the most famous person to watch the Zips play was LeBron James, who Dambrot coached in high school. "And even he can’t compare to the President of the United States," Dambrot said. Robinson said he knows Obama has a busy schedule but said he usually stops by Beavers games or practices in the rare case when their schedules match. "We would be honored," Robinson said. The presence of the president adds a little buzz to what’s a solid field at the Diamond Head Classic. Games will be played Sunday, Monday and Wednesday; on Tuesday, the football teams of basketball tournament participants Oregon State and Boise State play in the Hawaii Bowl. Unbeaten and No. 13 Iowa State is the favorite to win the eight-team tournament. Saint Mary’s, which already beat Akron in early November, is probably the top team on the other side of the bracket, which also includes Boise State, Hawaii and South Carolina. The Akron-Oregon State winner will play Iowa State or George Mason on Monday. Dambrot said his team has bounced back nicely from a scheduling quirk that saw the Zips lose at Saint Mary’s, then four days later at Middle Tennessee, then go three weeks before playing again. Akron has since beaten Cleveland State, Oral Roberts and Detroit, all good wins in the mid-major world. "I think most people who (follow) basketball know that we lost to two good teams on the road in back-to-back games," Dambrot said. "That’s not to make excuses. But I think if you sat down and looked at our schedule before the season started, you’d say 5-2 going to Hawaii is pretty reasonable. It’s pretty good. "We can be pretty good. We need to get better and we’re going to get better. This tournament is a great opportunity for us."